A year ago this border in the garden really annoyed me every time I walked past. It's at the other end of the veg patch gardens, next to the driveway, and was slowly filling up with rubble, litter, animal poo, toys, weeds and leaf litter. The large Viburnum x bodnantense shrubs at either end were overlooked in favour of the detritus underneath. Finally I could stand it no more. I gave up a weekend to clear it all out, dig the soil over, and think about planting it up. A year on, this is the state of progress. I managed to miss the deadline for Lucy's Tree Following last month so this month will be an introduction and a catch up on my tree so far. Firstly, which tree to choose? We do so well for trees here in the UK. 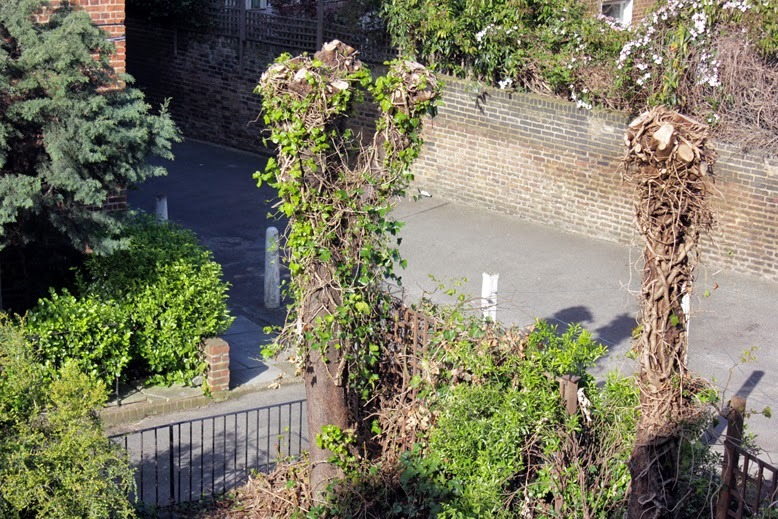 The canopy of these London Planes completely shaded this garden in past years. Also under consideration is my urban orchard; eight fruit trees planted as one-year old bareroots in December 2009, this is their sixth year in the veg patch. 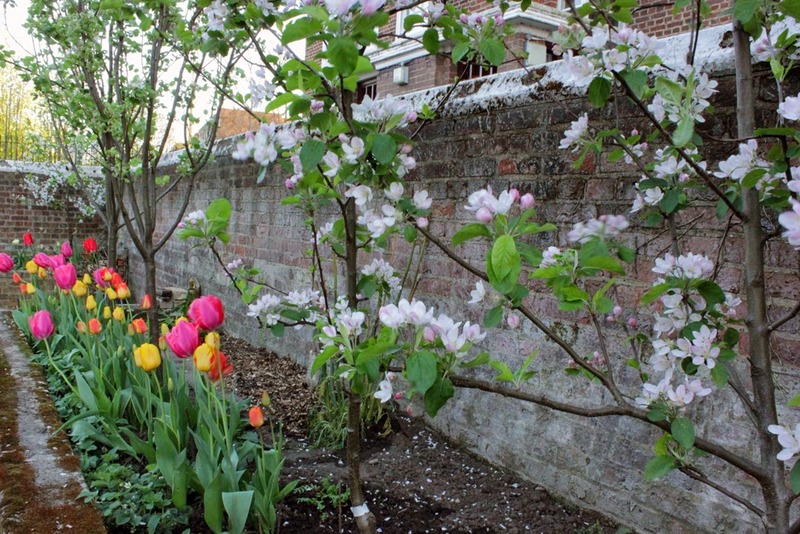 A specially-developed-for-London apple tree joined the patch in January 2013, making nine trees. I really feel I should get to know them better. They were covered in buds in March and I honestly can't tell a leaf bud from a fruit bud plus there's the whole pruning for fruit thing. Worthy of a closer look? I've also just added a quince tree to this collection. I haven't grown quince before so if excitement levels are a measure of tree following worthiness, this would be the one. Tangled branches of Ulmus glabra. But there's more. Just when I'd almost decided, I walked past a tree of such quirkiness that I was all of a doodah. Ulmus glabra, also known as Wych elm. This is in front of the manor house at Capel's Enfield site and I met it on an ident walk in my first year. Its pendant branches hide a glorious spaghetti like tangle on top of the trunk but the downside is that I probably won't see it during the summer months until my college studies resume. It was a real contender though and one I may sneakily report on from time to time throughout the tree following year. Being realistic, the trees I see on a daily basis are my fruit trees so I'm going to follow these. I know I should pick one but as an orchard they all contribute to the garden. Mid border looking south: two apple trees, two pears and a cherry in the corner. Over the past few weeks the blossom has been luxuriant with the pear and plum flowers showing first, followed by cherry and apple. The plum blossom has almost gone leaving the cherry blossom to steal the show. So many people have stopped to comment or take photographs and I'm really pleased that all this beauty is getting noticed. I think the most interesting of these trees to look at (at the moment) is the cherry tree. It's a Morello which is a sour cherry - good for pies and compotes (and perhaps dipped in dark chocolate!) but, for me, not for eating fresh off the tree. 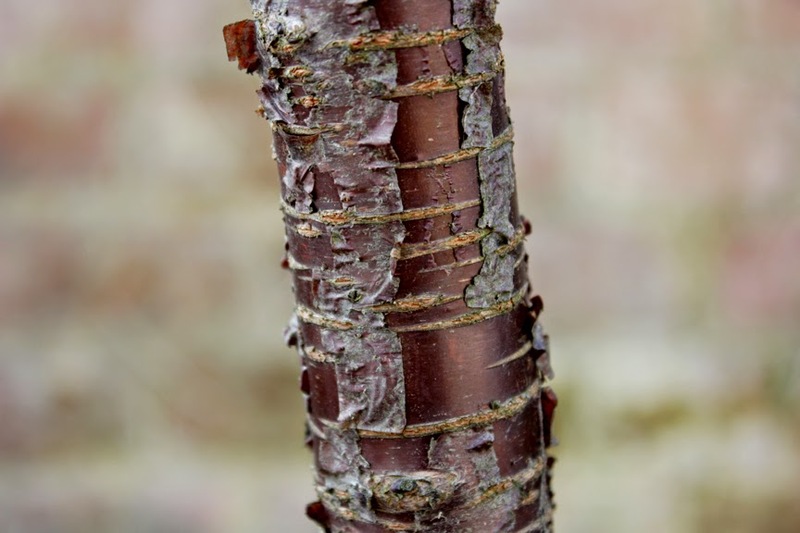 I love the bark on prunus trees, this one is no exception being a deep bronze. Like some Silver Birch trees, the young bark peels off to reveal a beautiful surface underneath. I don't know if this is standard for cherry trees, I'm certainly enjoying the effect on this one! One other point of interest about this tree: a couple of years ago, I found a tiny plant growing out of the soil under the tree. I assumed it was a sycamore or such like and was about to pull it up when I saw a split cherry pip by the tiny plant. I carefully transplanted the tiny tree to care for it on my balcony and then replanted it a year later. That was a couple of years ago. The tiny tree is now about 13 inches high; I'll probably have to plant it into it's final place at the end of this year so that it can grow big and strong away from its parent. May 2012, just a seedling. March 2014 coming back to life; April 2014 in leaf. Looking up into the canopy of blossom - look at all those potential cherries! PS. 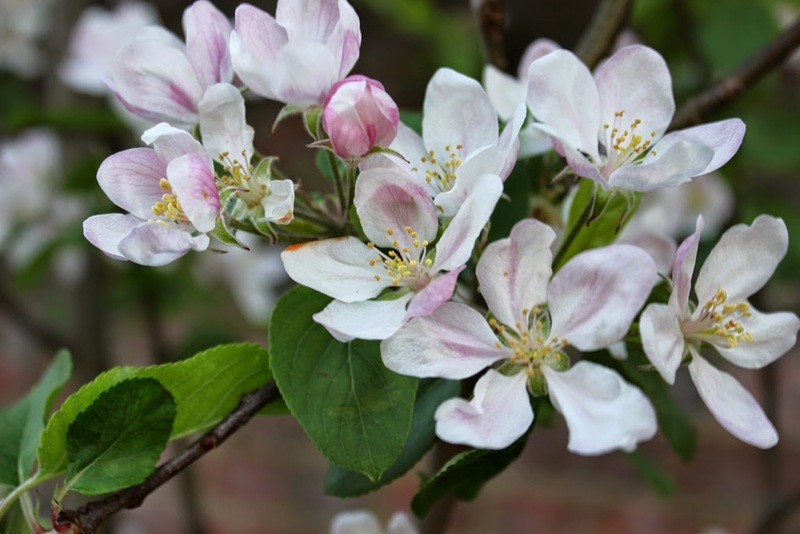 The apple blossom is looking pretty special too at the moment! Gastropod, the biological name for a slug, literally translates as stomach foot. 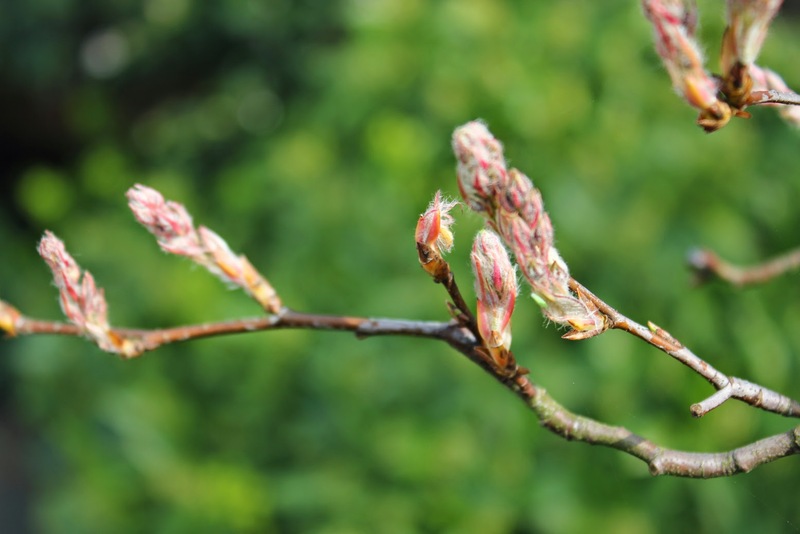 At any time of year, it's good to have some strategies in place to control them but it's especially important in spring when tender little plants and seeds are about to go out into the garden. I was reminded of this when my cousin mentioned that he'd returned home to find half his marigolds were missing after being away for just a few days. 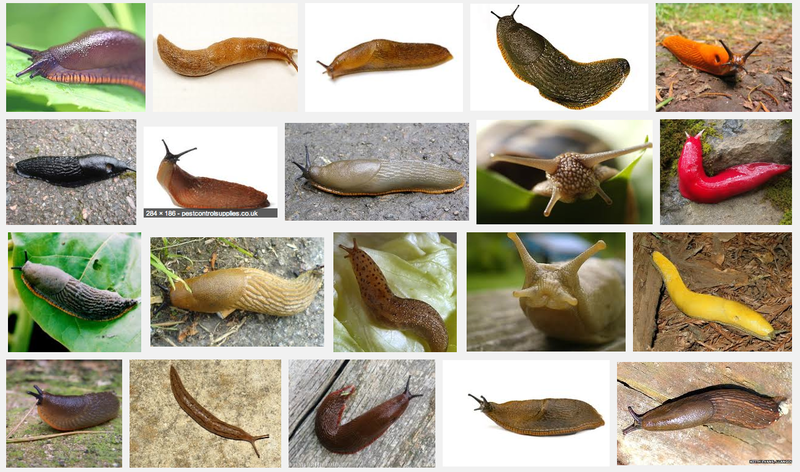 According to this fact sheet, 95% of slugs are underground munching on seeds, laying eggs, chomping roots. They've been around since the Ice Age so nothing we gardeners do will permanently eradicate them, especially after the nice wet start to the year that the UK has just had. 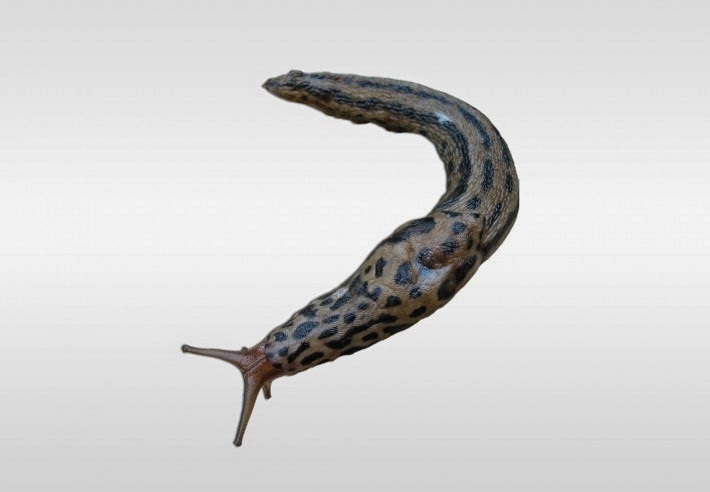 There is one slug that apparently prefers to eat other slugs rather than plants and that's the Leopard Slug. I found several last weekend during my slug search; not knowing any better, they live no more. Next time I'll spare these. Friend: Leopard slug. Easily identified. Looking for further slug facts, I came across a link to an article about Killer Slugs which made very disturbing reading. The so-called Spanish slug (actually, probably not from Spain at all) was identified by the Head of Entomology at the John Innes Centres in Norwich although they may have been in the UK since 1954. He found hundreds of these very large slugs in his garden and did a bit of research. They're a voracious and invasive strain and have been known to eat each other if nothing better is available … for instance, native slugs, dead mice, animal faeces or a row of lovingly tended lettuces. They live for up to a year and will lay about 400 eggs in that time which hatch in three to four weeks. Slug eggs and baby slugs are lurking under leaves and in the soil ready to slither into action when the weather warms up and it's predicted that this year will be another bumper year for these crop decimators. So whether your garden or plot has Stealth Slugs, Killer Slugs, garden slugs, tree climbing slugs or slugs in a rainbow of colours, it's time to take action. My favoured method at the moment is search and destroy: swift decapitation with the edge of my copper trowel then throwing the bodies out for the birds. I hope in this small way I'm winning the war without unbalancing the eco-system. For gardeners of less clinical disposition, I've given some thought as to how to best be prepared for the annual slither and munch fest. Clear leaf debris. Fallen leaves provide a protective winter mulch for the soil. Most leaves will not decompose fast enough to be of benefit to the soil so should be raked off anyway in the spring. Ditto any decaying/old leaves or other matter; these should be cleared to allow light through to the emerging shoots. This year, I've cleared debris sooner to deprive overwintering pests of their warm, dark shelter. Coffee grounds. This was touted as a good slug deterrent a few years ago. Living near a deli with excellent coffee, I had access to copious amounts of coffee grounds; I tried it but remain unconvinced. Allegedly slugs are deterred by caffeine but the same grounds will make seeds and tender seedlings very unhappy. (I tried coffee grounds on a test bed a couple of years ago and nothing grew there.) A laboratory test of Starbucks grounds showed them to be slightly acidic (pH 6.2) and nutrient rich (nitrogen, potassium, phosphorus, magnesium and copper), probably a bit too much for seeds and seedlings to cope with. 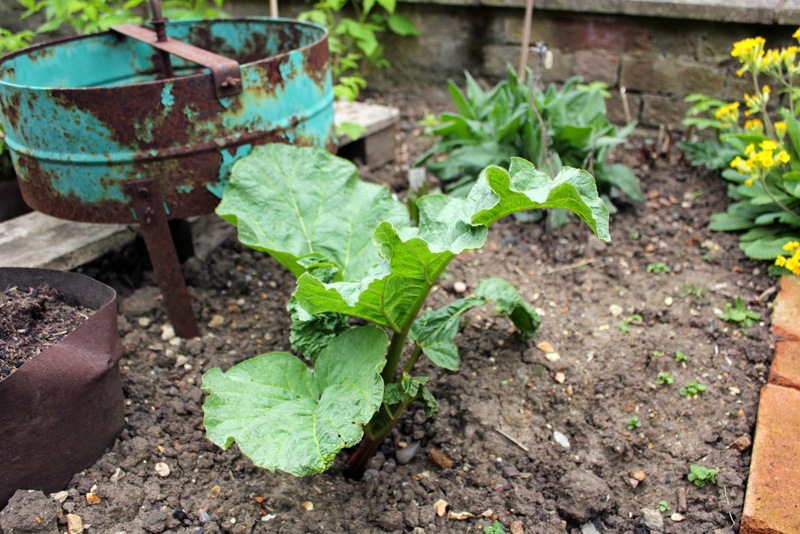 In 2012 the RHS alerted gardeners to an EU ban on using coffee grounds as an organic pesticide - article here - although your behaviour won't be considered subversive if your grounds are applied as a mulch. If you have an excess of grounds (which I have after stopping for coffee at Costa coffee on the M3 where they bag up the grounds for customers to take), they make an excellent addition to compost or can be added to blueberry shrubs, camellias or other plants preferring an acidic soil or ericaceous compost. 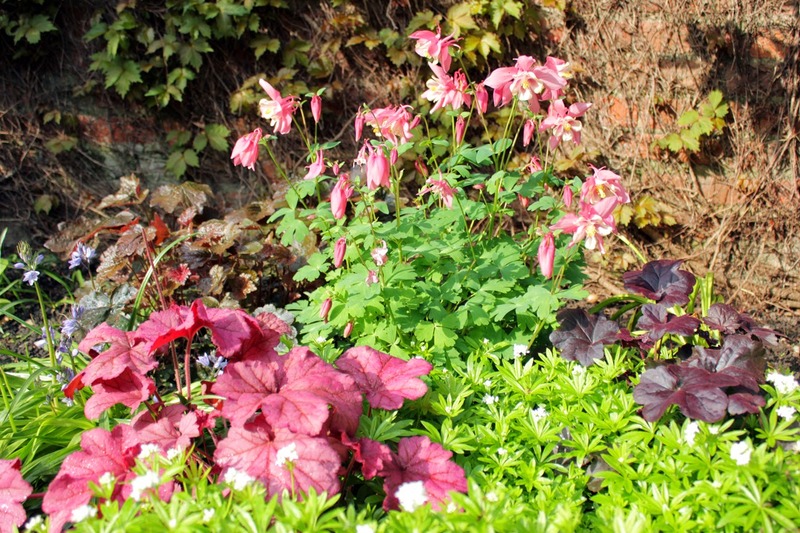 Grounds added to the soil should be incorporated well; once the grounds have been broken down by soil organisms, the minerals they contain become available to plants so grounds make a good slow-release fertiliser. Egg shells. Killer slugs have been seen eating snail shells so I suspect mulching with egg shells won't help much. 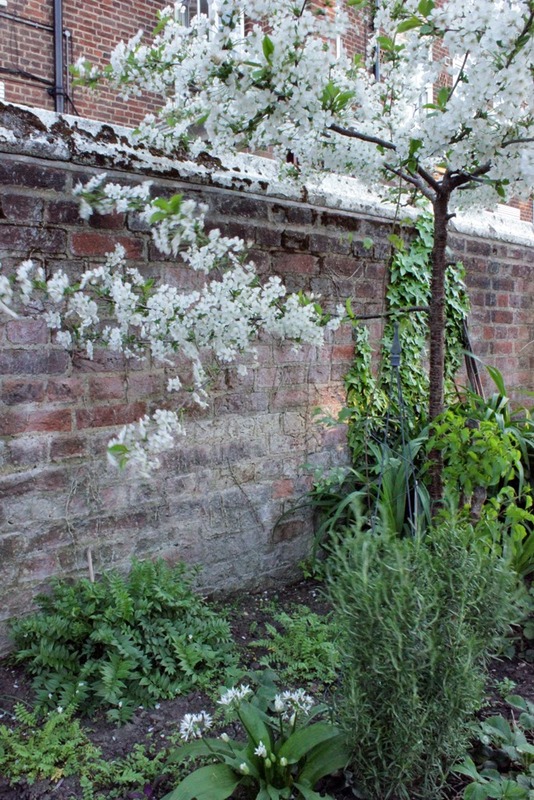 Last year, I mulched around my broad beans with a large dish of washed, crushed and baked eggshells. As baking eggshells hardens them up, I thought the added crunch might be an extra deterrent. I found slugs in the soil but my beans were okay, and the eggs shells were dug into the soil afterwards. This treatment made no difference to my hostas which disappeared overnight. If nothing else, adding eggshells to the soil will slightly boost calcium. All plants need calcium, with apples, brassicas, legumes, potatoes and tomatoes especially so. Don't add eggshells around plants such as blueberries as they prefer an acidic ericaceous soil - eggshells are alkaline. Nematodes. This works .... but only for a few weeks. Nematodes destroy slugs from the inside and need to be watered onto the soil during damp or wet weather. Salt water / hand picking. I introduced The Sluginator to my slug controls a few years back. It's a large plastic bottle containing salted water. (Hot water is quicker and so slightly more humane.) It needs a lid, otherwise slugs will climb out. Regularly slug patrol your patch at dusk, dropping any adult slugs into the salt water which kills them. I'm squeamish about touching slugs so keep my gardening gloves on. Beer traps/grapefruit shells. Slugs can't resist a good jolly up and will wend their way towards the pub of doom, never to emerge again. Sink a plastic container (eg cut down milk carton) into the soil, part fill with beer, empty when gruesome. Grapefruit halves placed dome upwards on the soil will attract slugs. If propped up slightly so the slugs can get under, you'll find several lurking within come morning. Then you can decide what you're going to do with them. ... Copper tools. I use a PKS copper trowel which is reputed to deter slugs. In the wet summer of 2012, although I had quite a few slugs, I didn't have the plague of slugs that others reported - and yet I saw slugs roaming in packs elsewhere in the garden. Use a copper trowel to have a little dig around your beds: If a pile of pearl-like eggs is unearthed a few inches deep in the soil, get rid of them. This is slug spawn. Petroleum Jelly. I haven't tried this but have heard that a slick of jelly around the base and top of pots will act as a barrier to slugs and snails. Mint/Sage/fennel/chives. 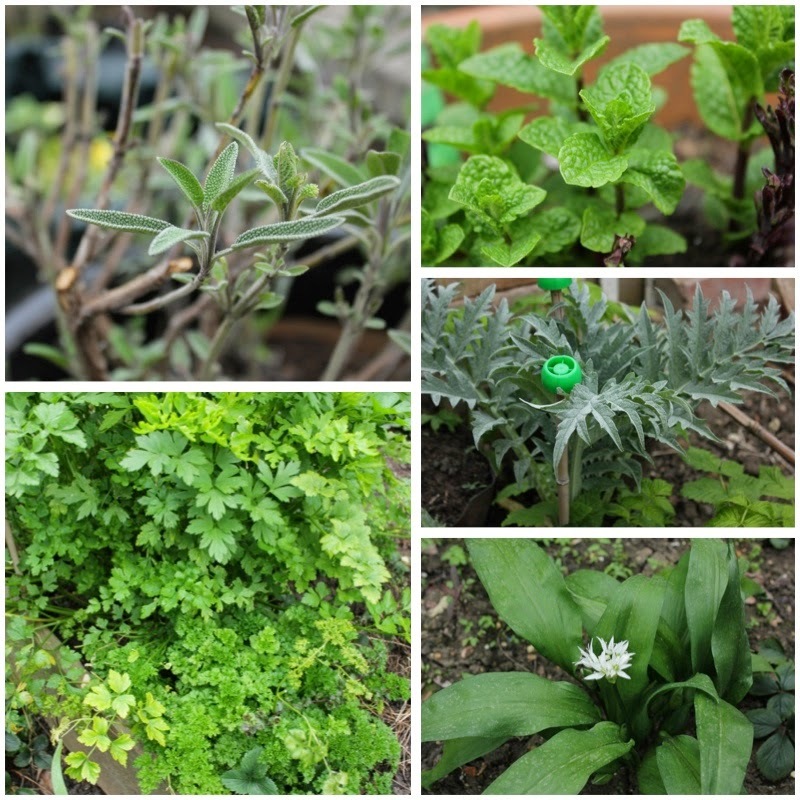 Allegedly planting these herbs or adding these to your mulch will deter slugs. Worth a try. So there we have it. Personally, I believe no single method will keep slugs at bay but using several at least gives your plants a fighting chance. Dare I say though that, as with all creatures in the garden, slugs are an important part of the eco-system so balance is needed. Good luck! Slugwatch is a good website for identifying slugs and more information. There's never enough hours in the day is my mantra as the gardening year starts up in earnest. March can sorely test a gardener's resolve to resist sowing too early. 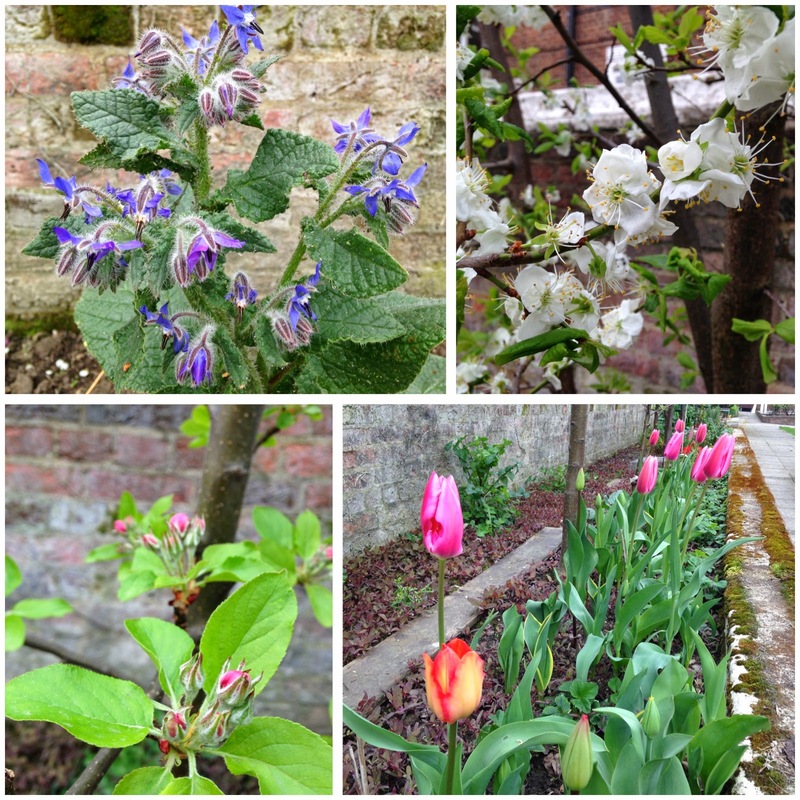 As fruit trees come into blossom, fingers are crossed against the possibility of frost. It's been such a brilliant spring for blossom and, for once, beneficial bugs too. 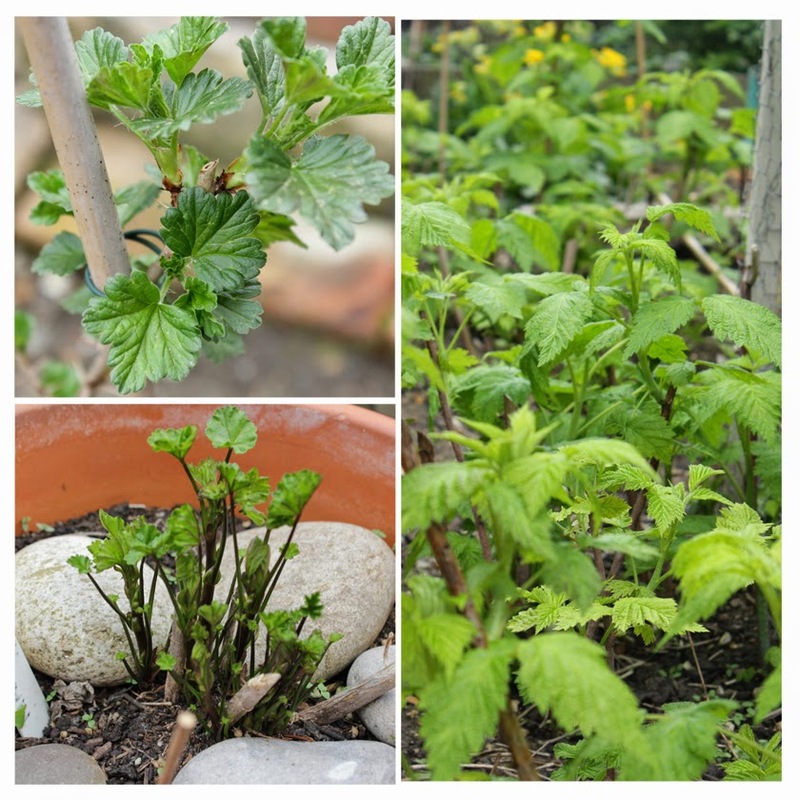 This year, with exceptionally mild spring temperatures, I've also been on the lookout for pests such as aphids, baby slugs and vine weevil grubs in pots. My searches have already proved successful; as I garden completely organically, this is an area to keep on top of. I didn't completely resist the urge to sow: French beans, peas, mange tout and courgettes were sown into modules on the 11th March, with the intention of having plants ready to go out at the end of April. The peas are growing strongly and are ready to be potted on, the beans and courgettes are so inactive that I'm wondering if I actually sowed any in the modules! A gentle poke around may be in order. It doesn't matter if they don't germinate because there's plenty of time to resow. Once the first lot of peas and beans are planted out, I'll sow another lot to have fresh veg over a longer period. I'm writing all this down in my little black book - it's amazing how quickly the details get forgotten. For this first round, I'm growing (or not, as the case may be) four each of Bingo, Sugar Ann and Delikatess peas, four Golden Sweet mange tout (a tall yellow podded climber), two yellow courgettes, two striped Italian courgettes and eight Canadian Wonder bush beans. All of these have been started on my balcony in an unheated propagator. Meanwhile, down in the veg patch, herbs that were cut back are regrowing strongly, a raised bed has been sown with Karmazyn broad beans - 23 in total, the 24th space was already occupied by a bean I'd found in last year's bed and shoved into the soil last December. It was a tiny seedling when I planted the other beans and is still the only thing showing in that bed. It's only been three weeks but, given the recent warm weather, I was expecting to see something other than last year's sunflower seeds germinating. Dare I say that some typical April showers would be helpful? Sweet peas sowed on 24th February were all growing nicely by 17th March, the new Sarah Raven seeds giving 100% germination and being the quickest off the mark. They've all now got their fourth set of true leaves and have been pinched out to encourage sturdy bushier plants with more flowers. I'm following the advice given by Wellywoman in her book The Cut Flower Patch to maximise my chances of success! The pear and plum trees are currently covered in blossom, just ahead of the cherry and apple trees. It's a glorious sight that the bees are aware of - there's also a few self-seeded borage plants in the fruit tree border for extra nectar for hungry bumbles. The tulips under the trees are just open while February's narcissus are still blooming! At this stage, I'm quietly optimistic of a good fruit harvest this year. Salad news: I've sown a small raised bed with a selection to be used as 'cut and come again' salad leaves: rainbow Pak Choi, spinach Reddy, Bull's Blood beetroot and Lamb's lettuce. The Pak Choi has germinated well; any thinnings will be transplanted and grown on elsewhere. As soon as I've built another raised bed, that too will be sown with more lettuce varieties, this time to grow on into larger plants. Upstairs on my balcony, I've added a couple of window boxes for more quick pick salad. I've repotted the lemon verbena; this plant would grow into a large bush if planted out into a border but I like to keep it nearby to pick the leaves for tea. The little chives plant that I planted on from a supermarket buy last year died back over winter but is putting on good strong growth this year - must remember to keep watering it! A couple of days ago, I bought some inexpensive slimline greenhouse staging - 4 wire shelves on my sheltered balcony mean that I can start seed sowing in earnest without clogging up my windowsills. Space, the final frontier. My big job for April will be to try and fence all the way round the Veg Patch island. Having tried fencing off individual beds with strong plastic netting, I've found that there's one bed where cats are still getting in - and it's not buried treasure they're leaving behind. Coated wire netting seems to be keeping animals out of individual beds, but then it becomes an effort to weed the fenced area. Fencing around the perimeter is the next option to try. I'm hoping that this latest plan will work; we're all so fed up with picking up poo that unless this is sorted, it could be curtains for any ground level food growing. 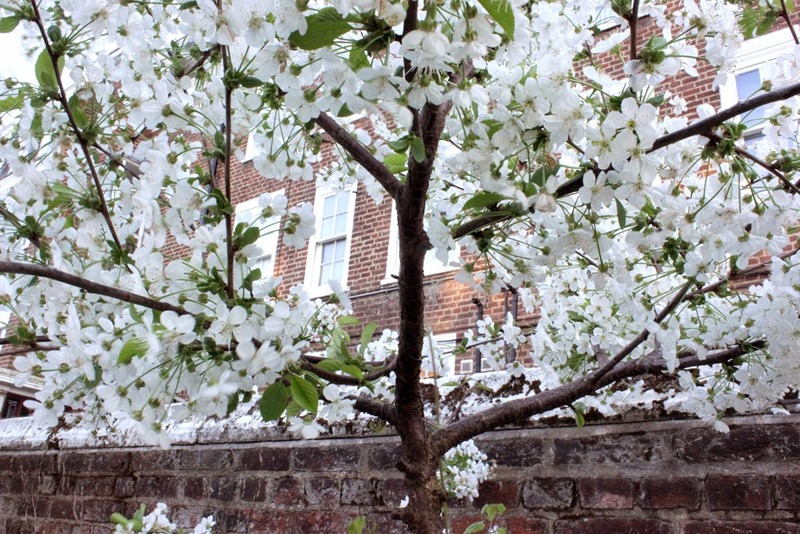 On a much more positive note, Victoriana Nurseries have donated a quince tree to the community garden! That brings my fruit tree total to ten trees. If nothing else, that's an achievement that I'm very proud of. 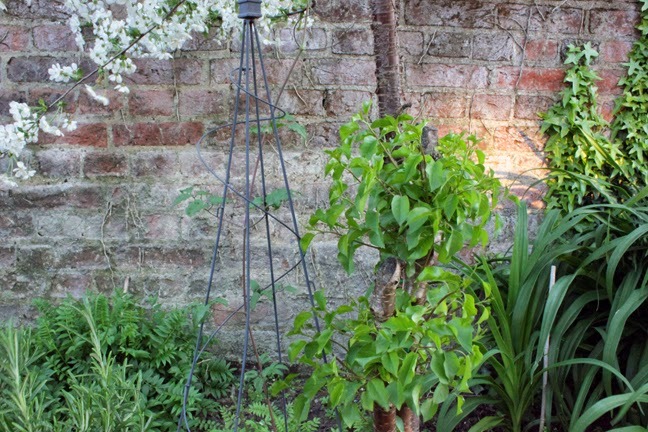 The quince is a bare root tree so, until I've decided where to position it, I've planted it into a large pot of multi purpose compost where it will be well watered and happy. Any trees supplied with bare roots should be given a good soak in a bucket of water to rehydrate the roots and then planted as soon as possible; ours will be planted this weekend. So what's in store for April? Next on the agenda, after fencing, is weeding. That's the price I've paid for not cutting off the Orach seedpods promptly. Seedlings are growing in the fruit tree border and popping up by the thousand. I want to sow some meadow flowers under the fruit trees and don't want them, or the trees, competing with the orach seedlings for nutrients so they'll have to go. (I might just keep one or two … !) I've got herbs, honeyberries and raspberry canes to plant out and seed sowing on my balcony will begin in earnest this week so there should be some progress to report by the end of next month! Happy gardening days are here again!